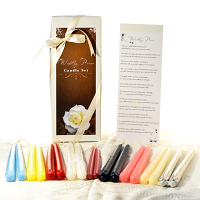 This wedding poem candle set is a very popular bridal shower gift or wedding gift. The poem has verses which direct the married couple to use taper candles of different colors at landmark events in their life. The colored taper candles used in this bridal poem are hard to find all in one place, or in multiple places for that matter, so we have put together the complete set and gift boxed it. This wedding poem is neatly packed in a white box with a beautiful front label and a ribbon tied around it. Inside the wedding candle poem is 9 pair of colored taper candles with the white ones wrapped in lace and a copy of the wedding poem on a durable card. i was really happy to see the quality of the candles. They are beautiful.